Of course, you should always back up your data, but I always think "They're just switching around some files, what could go wrong?" The download for Windows 7 RC is available. Yes, and free product keys for all! 2) Browse to the Sources folder. 3) Edit cversion.ini with notepad. 4) Change "MinClient=7077.0" to "MinClient=7000.0" (or whatever your build is, you should be able to see your build version on your desktop) and save the file. 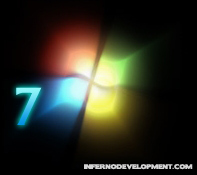 It's usually recommended that you have a Windows 7 DVD burned and ready, in case of problems (this is very important). Therefore, you may want to download PowerISO and using Windows Explorer, grab all the files and folders where you extracted your ISO file using WinRAR, and then right click "PowerISO > Add to Image File..." (you should see this option if you installed PowerISO and restarted computer). Note: PowerISO may not work if you do not have full version, so you may have to settle for another program like ISO Recorder v3. Burn it as an ISO file. Then using either PowerISO or a program like ActiveISOBurner, you can burn it to a DVD. Then install from there, you should have the option to "Upgrade" after you click "Install Now" because of the modified cversion.ini. Awesome, I can finally upgrade without a reformat.